The special train service between Coimbatore and Pollachi, which was suspended eight years ago on was re-launched on Saturday. COIMBATORE: The special train service between Coimbatore and Pollachi, which was suspended eight years ago on account of the conversion to broad-gauge line, was re-launched on Saturday. 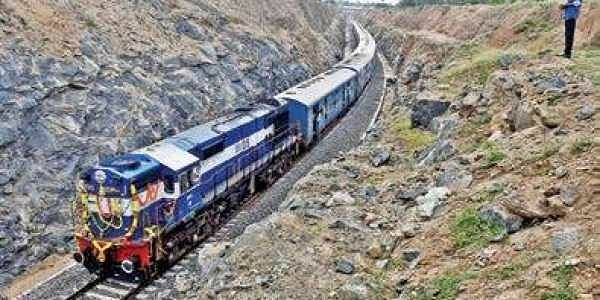 The passenger train service was suspended between Coimbatore and Pollachi, around eight years ago as the Railway Department planned to convert the metre-gauge railway tracks to broad-gauge railway tracks. On Saturday afternoon, the passenger train service started at 1.35pm, and reached Pollachi at 2.45pm. The train stopped at Kinathukadavu and Podanur stations. According to railways officials, the passenger train consists of eight unreserved coaches, which could occupy over 100 people. “This is a special passenger train on a temporary basis. We would get the permanent train for the route in the next couple of months, after which we would be able to run the train on a daily basis,” official said.